On 20 April 2017, Prof John Webb administered the UCT Mathematics competition at George High School. The excitement that learners experienced is reflected in the faces of these Thembalethu High School entrants. 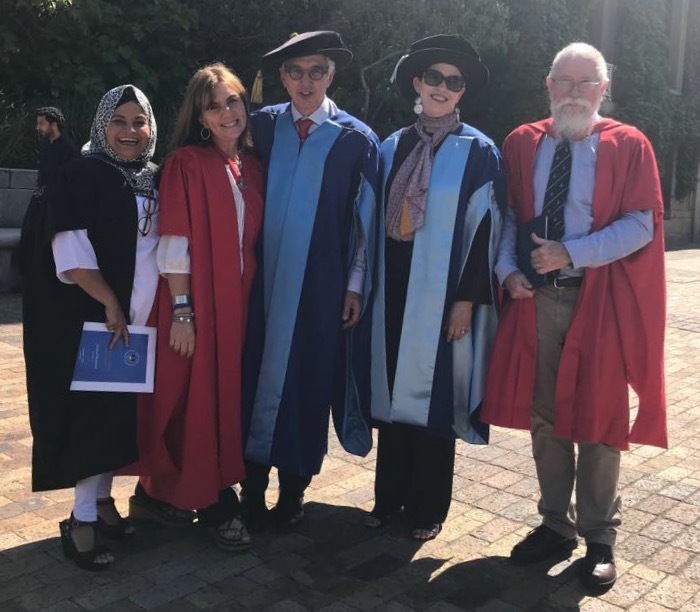 Our cohorts of Advanced Certificate in Education (ACE) and Advanced Certificate in Teaching (ACT) students graduated from UCT on Wednesday, 3 May. 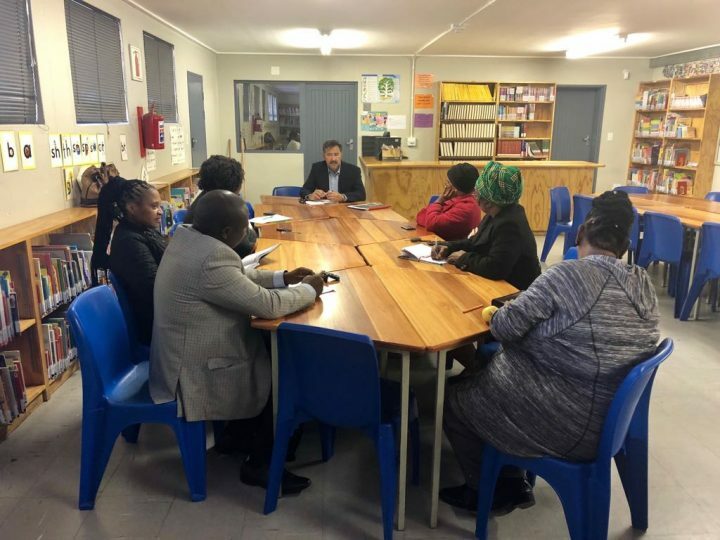 As part of the School Management, Curriculum and Teacher Support Programme, our partner, UCT’s School Development Unit (SDU) observes a school assembly. This is an element of their ‘case study’ of observations, interviews and focus groups. Patti Silbert from UCT returned to Sophakama Primary School on Friday 17 August, after an initial three-day visit, to observe the morning’s assembly. 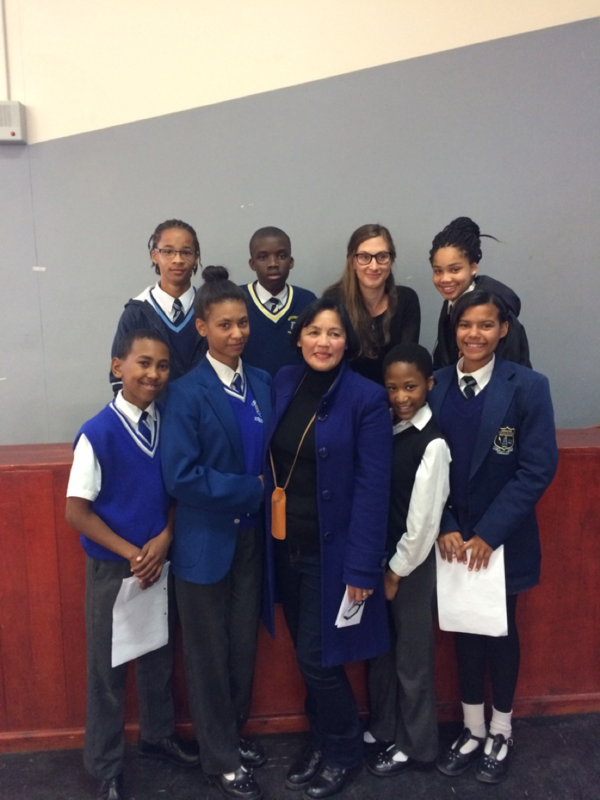 She also interviewed the Deputy Principal, Mary Nel, as well as two Rogz Academy Books and Beyond (RABB) team members. Patti’s comment about the assembly: ‘Imagine if the school could start each day like this!’ – Children were disciplined, but spontaneous. Singing and dancing flowed naturally after announcements. What a positive experience! Patti and her team are hoping to provide a written feedback report to the SMT and RABB by the end of Term 3. 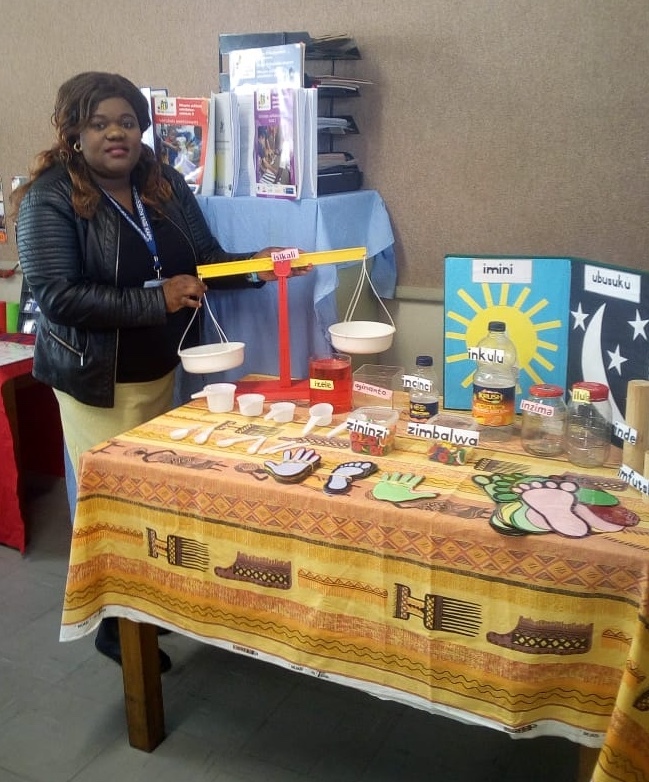 Diane Hendricks and Nomfundo Mfobo, SDU’s R-Maths trainers setting the scene to inspire their colleagues during the Phase 2 block training, 25 – 28 June 2015. 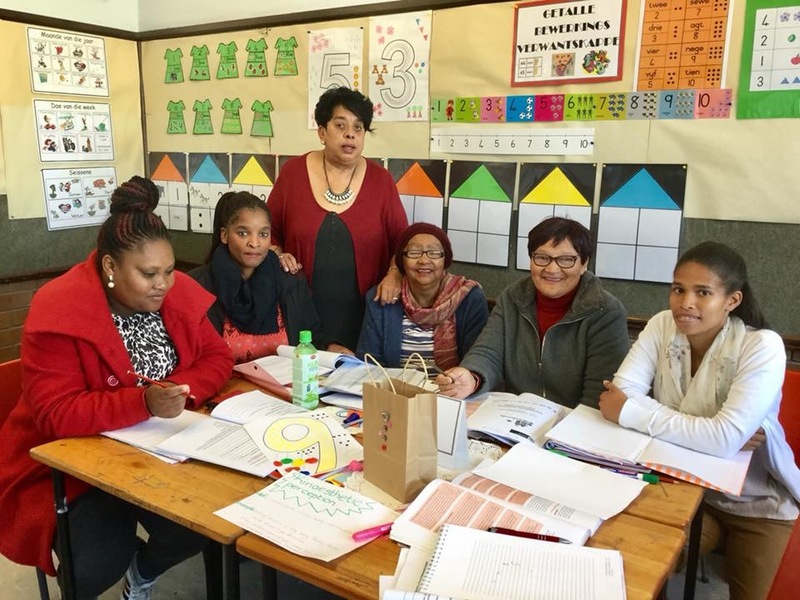 SDU developed the Grade R Mathematics Programme (R-Maths) and in partnership with the Western Cape Education Department (WCED) SDU trained ECD/Foundation Phase Subject Advisors and supported the training of approximately 3 600 Grade R practitioners/teachers. The Schools Improvement Initiative wins the Social Responsiveness Award. At the 4th April graduation ceremony, the SII received the 2017 VC Social Responsiveness Award. We wish to express our sincere gratitude to all our colleagues in the SDU, FHS and across the university who made this possible. We especially want to acknowledge our SII school partners and principals who were co-applicants for the award: Mxolisi Mbobo (Intshayelelo Primary); Mlungisi Siko (Ummangaliso Primary); Patrick Barnes (Usasazo Secondary); Themba Mbathane (Sivuyiseni Primary) and Phadiela Cooper (COSAT). The UCT-in-Eden Competition Day was held on 26 August 2017. Learners competed against their peers among the 15 project schools. Competitions were held for Grade 7, 8 & 9 respectively for mathematics and natural sciences. 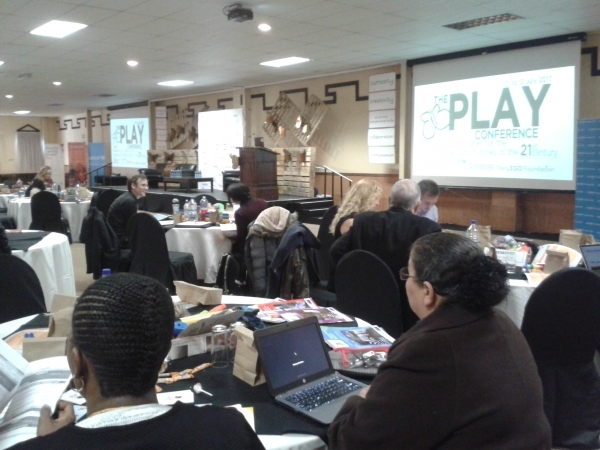 PLAY CONFERENCE, facilitated by Cotlands, Unicef, DBE, Lego Foundation. On 11-13 July 2017, St Georges Hotel, Pretoria. 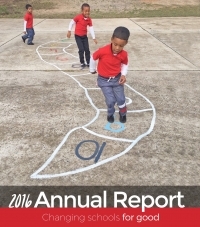 Main discussion: The Power of Play in preparing children for the challenges and opportunities of the 21st Century. The SDU R-maths team in Partnership with the WCED completed Phase 1 training of 1400 Gr R Teachers in the Western Cape. In the light of this Is is noteworthy that this R-maths programme is aligned to the competencies identified as being critical for teachers and learners for the future. 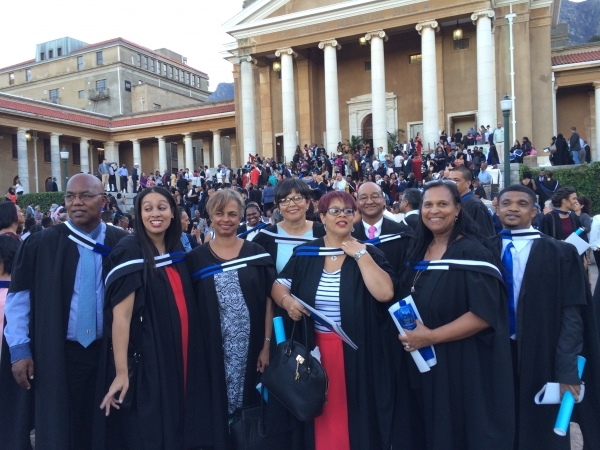 Our last cohort of Advanced Certificate in Education (ACE) students graduated from UCT on Wednesday afternoon. In all 11 graduated with and ACE in Curriculum Leadership in the Intermediate Phase; 14 graduated with an ACE in Curriculum Leadership in the Foundation Phase. 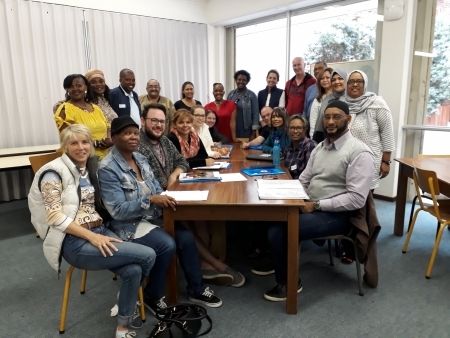 Participants from different WCED schools are presently attending the management short course Leading and Managing a Curriculum Delivery Team. The course is designed for school managers as well as those who aspire to upward mobility in the profession. For information on this, and other short courses on offer through the Schools Development Unit, contact Gary Powell (gary.powell@uct.ac.za) or Wadeeah Fisher (wadeeah.fisher@uct.ac.za ). Tami and Sue visited the Bulungula Incubator from the 19-22 April. This is on the coast in the Eastern Cape, 5 hours from East London and 3 hours from Umtata. They worked with the Education Project manager from Bulungula and 4 teachers from 4 Gr R classes in the area. 3-5 hour training sessions took place over 3 afternoons. Despite varied teaching contexts the training was successful and the participants valued the experience. 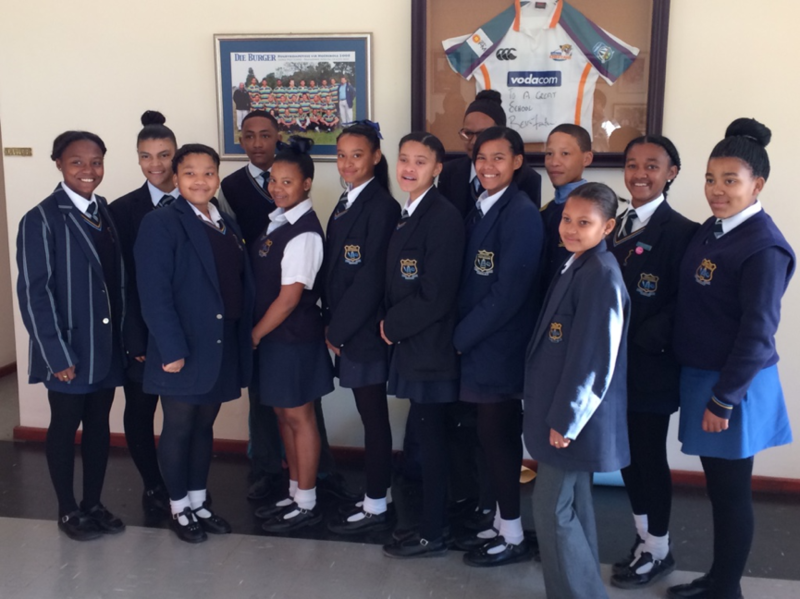 The UCT-in-Eden Book Club is facilitated at each of the schools by the energetic, creative Mrs Estelle van Rooyen. Learners entered creative writing pieces and posters for the competition. Tyhlora’s Book Club members Amahle Olisi and Siphokazi Petersen admire the display with Alulutho Gxokolwana, a runner-up in the maths competition.